Our life, a Jigsaw: Mr Niño is a trashman!! 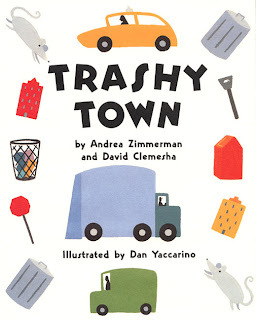 One of Niño's favorite books these days is Trashy Town by Andrea Zimmerman and David Clemesha. Its a book about a trashman Mr Gilly who has does the Oh So ENVIABLE task of driving a BIG blue GARBAGE TRUCK!! Yeah thats the enthusiasm and awe we see in Niño when he spots a trash truck and better still a trashman - well I am sure the big truck making rambling noises when the trashman empties the big trash cans into it has a great appeal - audio and video, and not without reason, for a 2 year old. In addition the book has a good rhythm to it with repetitive text - "Dump it in, smash it down! Drive around the Trashy Town!!" and two of Niño's favorite words "STOP" and "NO" on every page! So in addition to repeating the words of the book all day long, Niño also likes to pretend that he is Mr Gilly himself, drives his own garbage truck around the house and tries to turn each one of the containers (the bigger and bluer it is, the better, for its close resemblance to the actual trash cans) into the truck and 'dumps it in, smashes it down!' Things falling to the ground have a potentiality of cracking him up with laughter like nothing else does. That the contents of a 4 cu ft toy box are too much for a 1 ft long trash truck is something he still needs to figure out! !